The Allure of Dartmouth: twentysix in Dartmouth - what a find! 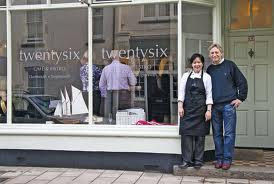 People MUST try new restaurant twentysix in Lower Street! This is what our lovely guests who stayed last night told us when they left this morning - they'd strolled for two minutes down the road from our door, discovered twentysix and had a fantastic meal there, and they just wanted me to let people know about it. So I am..! We had some brilliant food there on the opening night and hear they may now have some special offers on - check out their website and give them a try. We're sure you won't regret it. And no, Denise and Richard aren't paying me to say this - we just really like the place.